A springtime favorite! Our spring dog harness dresses by Doggles are not only stylish, but functional too! Made of breathable cotton in beautiful vibrant pink colors. Two-color lace ruffled trim skirt. Accented with white lace flowers on back. Walking your dog shouldn't be a chore, it should be a fashion statement! 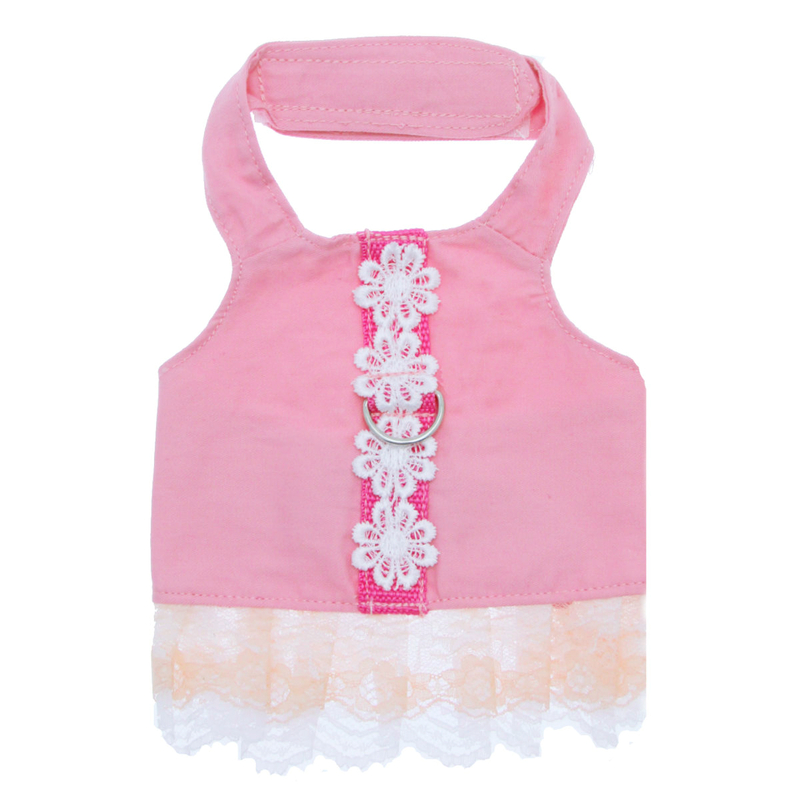 Not only is this Pink Flower Dress Dog Harness adorable, it is durable and useful on walks. For the ultimate girly dog, the harness has floral trim and a lace ruffle! Let your pup turn heads wherever she goes by wearing this season's most fashionable dog clothes. 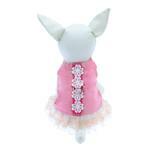 Our Doggles flower dress dog harness dress is sturdy yet soft. The D-ring leash attachment is reinforced for security and strength. The heavy duty touch fastener closure at the neck and chest are easy to use and provides an adjustable fit. Make sure your pup looks stylish, by wearing this season's most fashionable dog clothes. 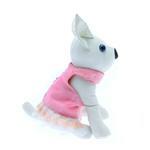 This pink dog harness dress is perfect for shopping, picnics and anytime your pup will be greeting the "paw-parazzi!" It's a lovely choice for Easter, Valentine's Day, and even Breast Cancer Awareness events. We suggest pairing this dress with a pink leash for a complete look. Flower Dress Harness by Doggles - Pink Customer Photos - Send us your photo! Baby Kookii is wearing her first harness in Teacup size, as she is only 2.4 pounds. She is a Parti Yorkie, which explains her unusual body colors. She is a very small dog. This toy was bigger than her lol. Please from now on can we have smaller toys. She is a 4 pound dog. The Flower Dress Harness has become one of Bella's favorite outfits this summer. Being a fashionista, Bella loves to dress up in her pretty clothes from BaxterBoo. The summer heat and humidity makes it almost impossible, but this pretty cotton harness is cool, comfortable, fit adjustable and stylish. It helps Bella maintain her fashionista status in spite of the heat. Thanks, BaxterBoo, for another great item! Bella loves fashion harnesses like this Flower Dress Harness from Doggies. It is cool, comfortable and perfect for the warmer weather. Bella can maintain her fashionista status despite the summer heat! Thank you, Baxter Boo, for another great hit! Chloe loves to look fashionable even while she's playing with her Frisbee. Nikita is my partner and co-pilot. Today she is showing off with her pink harness dress........."On your marks, get set and goooooooo! ".......says Niki. Itty Bitty Elsa showing off her new harness dress from BaxterBoo ! She is a dainty little Papillon girl just shy of 3 pounds! It fits! Lina posing in the bathtub display while at the festival with her humans. It's my sweet Mia's 4th Birthday! Sophie looks like a model in her fashion harness. Don't let my ruffles and lace fool you! Sassy loves her Flower Dress Harness by Doggles. This is my favorite dress. Doesn't she look like a Princess? Madison is wearing her daisy harness and pink bow from BaxterBoo. Every where we go people ask where she gets her pretty outfits. Love the harness, so easy to put on. She don't like anything over her head, so this item is great because of velcro close on neck & belly. LOVE IT, plus everyone thinks she's Sooooo cute. We love the Doggles Harness dress, it's feminine yet when Billie lunges at her arch enemies (any squirrel)it is strong enough that she can't break free. Gemi loves walks and all the attention she receives in her dress harness. My pretty Harness dress, and all of my other accessories. Thank You BaxterBoo! Because of you I am able to maintain Princess status!! SASHA B SO PRETTY IN HER FLOWER DRESS HARNESS! THIS HARNESS IS SOOOO CUTE AND SO EASY TO PUT ON! AND MADE REAL WELL TOO! LOVE LOVE IT!! THANKS BAXTERBOO LOVE YOUR SITE SO MUCH AND THE SERVICE CAN'T BE BEAT ANYWHERE!! "I am so ready to go walking..."
We love this harness!! Sasha knows she gets to go bye bye when we put it on her!! Thanks Baxter Boo!!! "Oh no...I'm in the middle of Mommy's flower planter...dressed in my new Pink Flower Harness!!" It came quickly and fit perfectly for her first vest experience. Shopping for more. I love the detailing with the lace. Very sweet. Posted On 08/19/17 by Diane K from Peoria, AZ Yes, Diane K recommends this product! Posted On 06/30/17 by Kelly D from Des Moines, WA Yes, Kelly D recommends this product! This was my puppy's first harness, I'm going to frame it! She didn't mind wearing it so she was used to a harness by the time she needed a real one. It's more of an orange-pink! Posted On 05/26/17 by KT from , Yes, KT recommends this product! This is so cute, my baby looks so good in it. Just love the clothes. Posted On 05/09/17 by Kelly D from Des Moines, WA Yes, Kelly D recommends this product! I ordered this in the smallest size for my new puppy, she's going to look so adorable in it. It's so cute!! my little dog has lost a little amount of weight she is now 10.5 lbs, i have the small - big on her but thats ok i still love it. Posted On 03/22/17 by Lauren H from Allentown, PA Yes, Lauren H recommends this product! my dog Roxy has a big chest of 17 i got the small a little big but its ok. love it a must have for summer. An adorable, adjustable harness that will keep your dog safe. Posted On 09/26/16 by pam c from Naples, FL Yes, pam c recommends this product! Posted On 07/06/16 by Susan & Bella M from Cranston, RI Yes, Susan & Bella M recommends this product! The pink Flower Dress Harness by Doggies has become one of Bella's favorite items this summer. As with all pieces we have received from Baxter Boo, it is well made and designed of high quality fabric which is cool and comfortable. The perfect marriage of beauty and function, this great piece is a must for the warm summer months. Thanks Baxter Boo for keeping Bella cool, comfortable and stylish! For your "girly" girl - adorable! Posted On 06/13/16 by Susan & Bella M from Cranston , RI Yes, Susan & Bella M recommends this product! The Flower Dress Harness is one of the prettiest items in Bella's closet. It is remarkably easy to wear and the feminine touches raise it from a utilitarian harness to a very pretty and fashionable summer outfit! Thanks Baxter Boo for a great idea and summer alternative! Posted On 06/03/16 by Joyce M K from Florence, OR Yes, Joyce M K recommends this product! Sizing is good, and it looks cute on Kayla. Missy absolutely loves her new pretty harness! The Velcro is very sturdy and holds well even when Missy is trying her best to get out of it. I love this harness! Posted On 05/05/16 by Susan & Bella Moretti from Cranston, RI Yes, Susan & Bella Moretti recommends this product! This adorable Flower Dress Harness is the perfect substitute for a doggie dress or t-shirt during the upcoming summer months. As always, I cannot say enough about the quality of design, fabric and workmanship used in this BaxterBoo product. Bella and I can't wait for the weather to break so she can break this out on her daily walks! Bella and I agree, BaxterBoo rocks! Posted On 03/09/16 by Jannette P from San Juan, Yes, Jannette P recommends this product! Love it! And my doggie too. Very elegant and cool for spring and summer. Everyone stops and comments about this dress and besides that, it's a harness. Very dainty! Posted On 03/08/16 by Jan K from Peoria, AZ Yes, Jan K recommends this product! I love this dress but it does run very very true to size if not a little small. It's so well made though. You won't be disappointed. Posted On 08/22/15 by Alisha J from Palmyra, MO Yes, Alisha J recommends this product! It is very cute, but still too big around the neck. She may still grow more. Cute harness dress and quality good, but way over sized for a small. I was able to sew a dart to tighten it up to make it wearable. It is great to find such cute clothes that are also a harness. My little ones love to wear clothes and this way they get to be fashionable on their walks. I love this little outfit, as it has the built-in harness latch. She is so cute and love that I can clip her leash and she doesn't have to wear an additional harness too. Fits perfectly. Angel loves it. Look so cute on the girls. I prefer the harness dress because I have petite girls and do not like to use the neck collar for leashes fearing it could really hurt them. Neck are 6 in or smaller! Posted On 08/07/15 by Trish R from Flint, MI Yes, Trish R recommends this product! Love, Love, Love! My baby is so little it is hard to find anything to fit her, but this works great, and cute to boot! Posted On 07/27/15 by Joanne G S from Morris, IL Yes, Joanne G S recommends this product! Posted On 06/23/15 by Carolyn F from Deerfield, OH Yes, Carolyn F recommends this product! Looks so sweet on my Poochon, Paris. Very light weight, so it's nice for summer. Posted On 06/10/15 by Kristy S from Concord, CA Yes, Kristy S recommends this product! Posted On 06/04/15 by Kelly V from Saskatchewan , Yes, Kelly V recommends this product! Posted On 05/16/15 by melinda m from , AZ Yes, melinda m recommends this product! Harlee is a bit of a Tom Boy with all her Motorcycle riding and car shows but she loves to get all prettied up and put on this harness with a white bow in her top knot. Fits her (5 lb Yorkie) perfectly and is very well made. Much cuter than the one in the demo video! Posted On 04/29/15 by Tammy B from San Diego, CA Yes, Tammy B recommends this product! I love the dress - it looks great on my Pug and it fits her perfectly! Posted On 04/09/15 by Holly K from Deerfield, NH Yes, Holly K recommends this product! So cute, the quality is superb!! Bought as a gift. Looks pretty. Love the lace! Posted On 03/12/15 by Marilyn B from Huntley, IL Yes, Marilyn B recommends this product! Love this cute harness. Good quality, bought it to have our chihuahua wear on Easter. She seems comfortable in it. Have always had good luck with Baxter Boo's clothing, great customer service. Posted On 02/26/15 by Jamie O from Haslet, TX Yes, Jamie O recommends this product! I ordered the cutest pink dress harness for my tiny Papillon. It fits fantastic due to the sizing information on BaxterBoo. She looks adorable! I also ordered a vest harness for another of my undersized Papillons. Both came very fast! Two days before expected delivery! Both fit perfect! Posted On 10/20/14 by Mary R from , TX Yes, Mary R recommends this product! I bought this for my smaller Yorkie but it was a liitle too big. It did fit my larger Yorkie and she looks very cute in it. Love this flower dress harness! It looks great on my little Coco. I bought quite a few clothing items from Baxter Boo. Quality is excellent & shipping is always quick. Posted On 11/08/13 by Francine S from Santa Rosa, CA Yes, Francine S recommends this product! Runs true to size. It is very cute and easy to put on. Posted On 11/08/13 by Debby G from brewerton, NY Yes, Debby G recommends this product! I just love this little pink dress. It looks so cute on my peek-a-poo. Posted On 11/08/13 by Lisa G from Lubbock, TX Yes, Lisa G recommends this product! Wish Doggles made more of these great harness vests - they are durable and fashionable - I have every single one ever offered! Everyone always comments on how cute they are and wants to know where I got them. Just a note that Doggles clothing seems to run large so be sure to watch measurements! Posted On 11/08/13 by Sue from Murfreesboro, TN Yes, Sue recommends this product! My Yorkie is a baby, when ordering this harness, I wasn't sure if it wold fit. I ordered the extra small, but the design using velco is adjustable to make it tighter or looser as she grows. I love it! Also ordered the matching leash. Not only were both very affordable which I could not find even a close price comparison at any store I shopped at, but the harness is so very cute on her and have received numerous compliments everywhere I take her. If you are considering this site, I would definitely recommend it. Shipping is fast and accurate too! Love walking my girl in this adorable harness. It runs a little small, shorter in length than I expected so it wears more like a shirt but very cute! Posted On 11/07/13 by Penny A from Loveland, CO Yes, Penny A recommends this product! This is so cute. My chihuahua looks so sweet in this. Posted On 11/07/13 by carol p from williamsville, NY Yes, carol p recommends this product! Princess Madison looks stunning in this harness. Practical yet beautiful.